In the previous we showed you how to create matrix effect with simple batch file. In this tutorial we will show you how to chat with ip address. After reading this you will know how simple it is. You just have to create batch file. Don't worry I will show you how to do this. You Can Know Your Ip Address By Typing My Ip Or What Is My Ip In Google Search. You Can Also Type "ipconfig" In Command Prompt. There Are Many Sources To Find Your Ip Address. It is used to find your approximate location based on your ip address. Let's Start The Tutorial On Chatting In Command Prompt Using Ip Adress. Want to know how to chat using command prompt. First of all you will need to get the ip address of your friend's system or whoever you want to chat. If you are using school or college system than the ip address will be in particular range. Open Notepad and paste the code given below and save it as .bat extension. Just name it as message.bat. Type your friends ip address after ip address of the user and hit enter. Type your message. 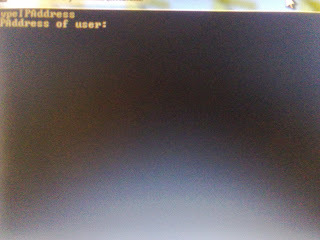 In your friends system command prompt will be opened with your message.